Here are some of the products we found during the International Housewares Show. The .com chair and the e-chair from Central Park combine greats looks in a comfortable chair. Both are available in five translucent colors: Purple, Green, Orange, Clear and light purple. 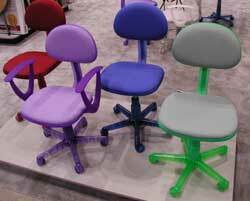 The difference between them is that the e-chairs have arms while the .com chairs do not. Some assembly is required. These chairs will retail for under $50, so what’s a little work for such a cool chair? 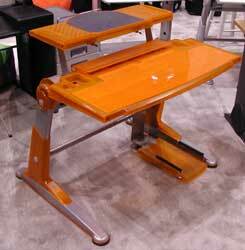 These cool looking workstations from icom combine functionality and cool looks. They are available in four tasty colors: Red, Purple, Orange and Blue. They will be available in a few months and will sell for under $500. the DIOS refrigerator and the Internet washing machine. LGE appears to be positioning itself as a leader in home appliance networking. Internet Microwave ovens have been commercial products for over a year (Read our coverage of Sharp Internet Microwave at 2000 Housewares Show). LGE's Internet Microwave uses an embedded modem for Internet access. 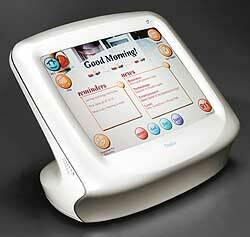 Its LCD touch screen panel doubles as a conventional microwave control and as an Internet access screen. It too can download cooking time and microwave levels for automatic cooking, as well as searching for new recipes online. Because you can surf directly from its front panel, you can bookmark food product sites as well as link to grocery stores for online shopping and ordering. 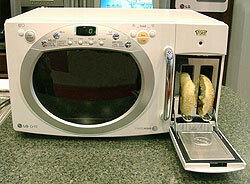 The LGE Internet Microwave oven will be available in December 2001 and will retail for about 1000 dollars. LGE plans develop further home appliances with Internet connectivity. Using what I call a “tub forward” design, the LGE Internet Washing Machine achieves better washing performance while lowering energy consumption. By tilting the washing drum forward by 12 degrees, vibration and noise are eliminated . Further benefits are a 30 percent decrease in water consumption, 25 percent decrease in power consumption and a 34 percent increase in washing performance. With all these benefits, I’m surprised this wasn’t done years ago. The LGE Internet Washing Machine has 107 patents, will be available in December 2001 and retails for about 1,500 dollars. captures and records still digital images with its built-in digital camera. can be used to get more information on cooking off the Web and to access new recipes. While these technological features are truly state of the art -- this refrigerator/freezer has over 75 technology patents -- it also has several high tech “refrigeration features” as well. The most compelling is its noise output, or really its lack of sound output -- this refrigerator is VERY quiet. This 23 dB output is accomplished using “the industry's first application of the inverter function to the two-door refrigerator”. It also consumes about half the energy of a typical refrigerator. While quite unique to the US marketplace, the DIOS was first shown off at a trade show in Dubai last year. Why Dubai? Well, Dubai is in a desert where refrigeration might be a desirable thing and this oil-rich area also happens to be very affluent. No doubt, LGE needs to find buyers with as much affluence and desire as it can, since this "i-icebox" sells for a mere ten thousand dollars. Available in two models, LTM900ST (Hi-tech stainless steel finish) and LTM9000 (High gloss white and black). These models will be available in April 2003 at $149 and $129 respectively. Roasting “green” beans at home is now much simpler than it has been in the past. Instead of the time consuming, complex and messy methods previously used, you can now get true gourmet coffee, fresher and richer than any made with store bought roasted beans. Roasting beans is a quick process, made simple through digital technology: put in the “green” beans, press a button, wait for about twenty-five minutes and then take out the freshly roasted beans! Restaurants and cafes cannot offer fresher coffee, unless they roast their own beans. uses a patented rotary drum technique. is dishwasher safe and easy to clean. 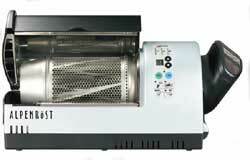 has an exterior that is cool to the touch during roasting, making it extremely safe. A wide assortment of Alpenröst custom-blended and Estate coffee beans are available, including decaffeinated and organically grown. 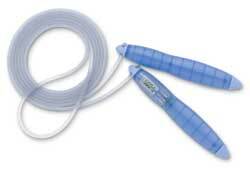 This translucent blue jump rope, the Tanita Jump Start, calculates the number of calories burned during your jump-roping exercise session. It does this by counting the the number of rotations and by using the known weight of the jumper, it can calculate the amount of energy expended, in calories. Thalia continues to work on their Home Linking Technology (HLT) that they featured at last year's Housewares Show. The greatest feature of this technology is that it requires no software to install, no programming and no home rewiring. AC powered devices communicate via PLC (power line communication) while battery operated devices communicate wirelessly via RF (Radio Frequency). Currently, the Housewares industry, along with the "computer" industry, is now facing the issue of creating an interconnectivity standard and communication protocol. Consumers won't buy these new "intelligent" appliances if they can't communicate with other "intelligent" devices that they purchased previously. Devices from different manufacturers have to function together and "play nice". If this doesn't happen, and devices aren't all compatible, consumers will be faced with the nightmarish situation of having certain "clusters" of intercommunicating appliances that "speak" amongst themselves, but not to others. This horrid situation would probably also require a kitchen-full of "master consoles", since each protocol requires its own controller. Few consumers would put up with this. Let's hope this becomes resolved soon. Once the protocol issues become resolved, these "intelligent" housewares products will still have to perform their intended function. Thalia and its licensees have created their second generation of interconnected devices. Here is a brief look at some of them. This central controller maintains the local yellow pages, to do lists, memos, shopping lists, address book, calendar and recipes. It features a kitchen timer, a 911 panic button and a calculator. Through an Internet connection it can download weather, news, coupons and recipes. Since it is made for the kitchen it is completely spill-proof. It uses touch screen technology so there is no need for a keyboard or a mouse. Optional accessories are a printer, a PC connection "bridge" and an RF phone module in case a phone jack isn't nearby -- remember the goal is -- no rewiring of the home. The Thalia HLT Kitchen Console is the master control device for all of the HLT appliances in the home. It can also be remotely accessed via the Internet so you can monitor the status of your appliances and turn them on or off. With HLT technology, no more flashing 12:00's after power outages since this coffee maker's clock is automatically set by the Thalia HLT Alarm Clock. 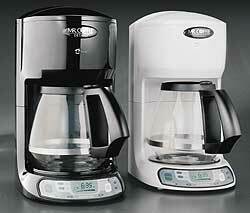 The best feature of this coffee maker is that you can easily wake up to a hot cup of coffee in the morning. The alarm clock tells the coffee maker to start 10 minutes before the alarm clock goes rings. It even reminds you if forget to fill it with water at night. 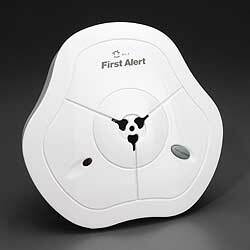 These smoke detectors not only sound an alarm themselves, they also set off the Thalia HLT alarm clock as well. This is critical, if the smoke alarm is far away in the garage or basement. An icon appears on the clock to tell you exactly where the problem is. If you enter your work or cell phone number, the alarm clock can call you if a smoke alarm goes off. 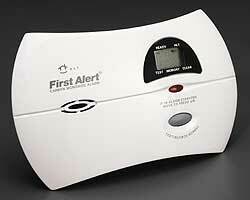 The Carbon Monoxide detector works just like the Smoke Alarm, but features a digital readout and trendy packaging. 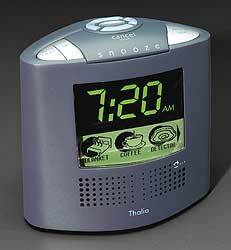 The Thalia alarm clock can turn the blanket before you go to bed so you now crawl into a warm bed at night. If you don't have fixed hours, you can use the Thalia HLT Kitchen Console to turn the blanket on manually before going to bed. The blanket automatically shuts off when the alarm clock goes off so you never have to worry about leaving it on during the day. With the Thalia Home, you never have to worry about leaving an appliance running. You can easily check or change the status of any HLT appliance from either the HLT Kitchen Console or the Internet. Several different kitchen appliances comprise the Oster HLT Meal Suite. There is a slow cooker, a vegetable/rice steamer and a bread maker. Since the master console has hundreds of recipes, meals are easier. The night before, you select your entrée, side dish and bread. Your Kitchen Console helps guide you through some simple prep work (many recipes need only 5 minute prep). Food is placed directly in the slow cooker crock, steamer basket or bread pan. You set the time you want the meal ready and the Thalia system takes care of the rest. The console automatically "back calculates" when to start each appliance and at what temperature to cook at, based on the recipe and the number of servings. Now, a warm, healthy well-balance meal is ready when you walk in the door -- this better than a restaurant. If your plans change, you can access the console via the Internet and change your arrival time. If you are worried about food spoilage, these recipes have been extensively tested to insure delicious meals. This small device is a real workhorse. It functions as an alarm clock radio as well as a simplified household control device. 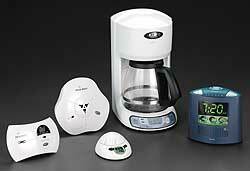 It interfaces with the HLT coffee maker, electric blanket, smoke detector and carbon monoxide detector. Want to see all this page in a more compact form? View the linked version of this article. It's a smaller download than this page, and each product's information is only a link away.